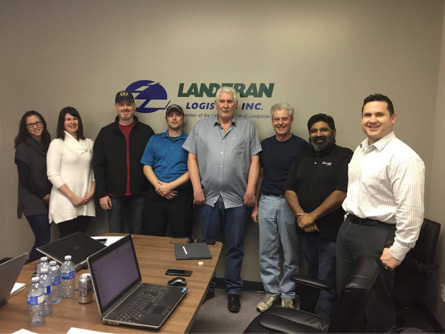 Landtran Logistics Inc. has taken the first step into the future with the implementation and training on PeopleNet Fleet Manager. 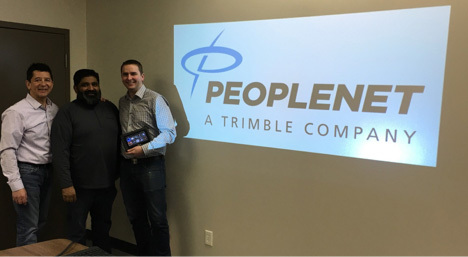 Over the next 6 months we will be proceeding to install PeopleNet into all of our fleet. PeopleNet will allow us to see and manage our fleet in real time. This will allow us to provide real time reporting on where our customers shipments are, to monitor and manage idle time and fuel consumption, implement and adopt ELogs, and to monitor our on road performance. Increasingly our customers are looking for real time reporting on shipment status and PeopleNet in conjunction with TMW's Truckmate will allow us to be able to automate our reporting on shipment status. We are very excited about the improved levels of service that these tools will allow us to provide our current and future Customers. Standing Left to Right: Sherry Bill (Office Manager Calgary), Jen Duggan (Senior Accountant Manager), Dennis Clarke (Operations Manager Vancouver), Shane Reynolds (Operations Manager Prince George), Rob Sutherland (Operations Manager Calgary), Lionel Bouchard (Operations Manager Edmonton), Mohammad Khan (Customer Project Manager-Peoplenet) and Will Pina (Health and Safety Manager). Standing Left to Right: Kim Evans (Assistant General Manager), Mohammad Khan (Customer Project Manager-Peoplenet) and Chris Langley (Business Development Manager).